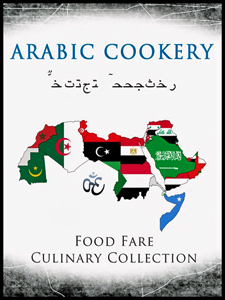 Arabic Cookery was released today as part of Food Fare's exclusive Culinary Collection. Arabic Cookery contains more than 250 traditional recipes from Algeria, Bahrain, Chad, Comoros, Cyprus, Djibouti, Egypt, Eritrea, Iran, Iraq, Jordan, Kuwait, Lebanon, Libya, Mauritania, Morocco, Oman, Qatar, Saudi Arabia, Somalia, Sudan, Syria, Tunisia, the United Arab Emirates (UAE) and Yemen. Arabic Cookery also contains common food words, information about holy days and other traditions, and resources for further study. Arabic Cookery is available at Amazon, Barnes & Noble and Kobo Books. The book also comes in Adobe Digital format, which can be obtained by clicking here. More than one hundred food images and nation flags are available in the Adobe Digital edition of Arabic Cookery. However, because of time-consuming and costly formatting issues, food images or nation flags are not displayed in Kindle or Nook editions of the e-book. Excerpts (PDF) and Screenshots are also available from Arabic Cookery.